Cristiano Ronaldo to miss Juventus’ clash against Man United at Old Trafford next month, after the forward was shown a straight red card in his side’s clash against Valencia. Ronaldo, who played for the Red Devils between the years of 2003 and 2009, will miss the chance to return to Old Trafford, after he was sent off at the Mestalla tonight. 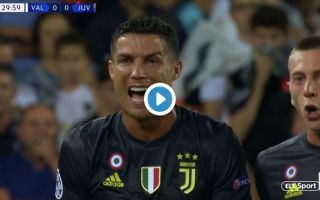 The Portuguese forward was shown the red card for an altercation with Valencia defender Jeison Murillo, but it’s not entirely clear what Ronaldo was exactly shown a red for. This now means Ronaldo will serve a two-game ban, and will miss his side’s clash against the Red Devils. Straight red, so would be a two-game ban, meaning Ronaldo would miss return to Old Trafford. Here’s a clip of the incident, and the result of it that will surely delight most Man United fans.